The recipient of the 2011 Technical Achievement Award was to Professor John Luxat (right in photo) of McMaster University. 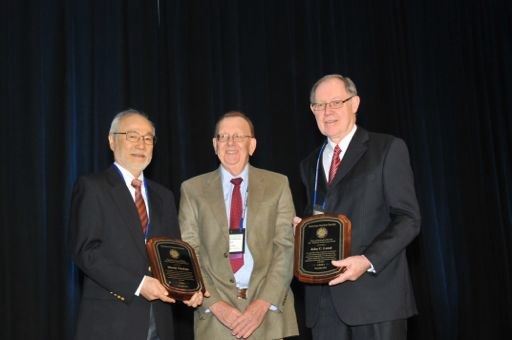 His award was deliverd by Professor Paul Turinsky (center in photo) representing the ANS Awards Committee as the present committee chair. Professor Luxat has had a long standing career within the field of thermal hydraulics related to nuclear safety analysis methodology, experimental studies in nuclear safety thermal hydraulics, and theoretical modeling studies in nuclear safety thermal hydraulics. Professor Luxat delivered his awards presentation in San Diego California during the 2012 ANS Winter Conference, during the plenary session of the subtopical THD meeting "Advances in Thermal Hydraulics". The presentation focused on reactor safety and risk in the wake of Fukushima.